Kirstin Karklin is blogging about ideas on how you make your wedding day extra special for that OTHER man in your life… Dad! We recently celebrated Father’s Day–A day where we take our dad’s to the golf course, BBQ with family, and honor our fathers for everything they do. One element of many weddings that holds true is the bride’s father escorting her down the aisle. As an only daughter, I’m very guilty of being ‘Daddy’s Little Girl’, and I’ve always wanted my wedding day to be just as special for my father as it is for me and the man I’m marrying. One of the most popular ways—and I think one of the most creative—to include your dad in your wedding day is to sew a piece of one of his shirts onto your dress! This can be done in one of the under layers, on the inside close to your heart, or in a big heart shaped patch out there for everyone to see. The ‘first look’ is becoming more a norm in the world of weddings. Having the groom see the bride for the first time in her wedding dress is a very intimate moment. 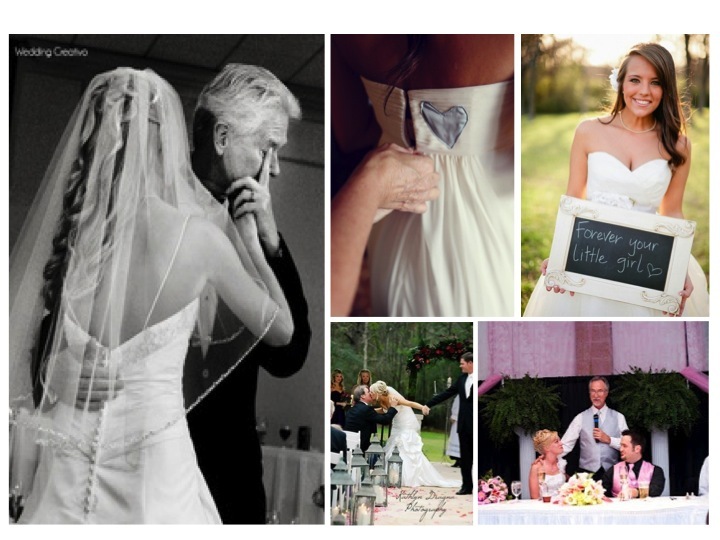 What many brides seem to forget is just how special that moment is to a dad! Consider a first look with your dad! A moment just for the two of you so he can see his daughter as a beautiful bride! As coordinators we always try and make sure a bride has a few moments be herself with Dad before she walks down the aisle. Lastly, don’t forget the father/daughter dance! This is one tradition I have a hard time passing up. There are hundreds of songs out there that are perfect for a first dance, (Sinatra, anyone?) but there’s nothing wrong with changing things up a bit! There are some awesome videos out there of non-traditional father/daughter dances. If you and your dad have a special song, recognize it! One of my favorite wedding moments was when a bride and her father rocked out to “Sweet Child of Mine” by Guns N’ Roses. So memorable and fun! For photo credits and more ideas check out the LOLA Pinterest Page.